Happy new month dear family and friends. I am glad that we are in the month of June 2016... June is a special month for me. My father's birthday and my wedding anniversary is this month!!! So I have a lot to be grateful for in the month of June. Happy wedding anniversary to all June brides and happy birthday plus congratulations to everyone celebrating this month. For a lot of people asking what do I have to show for the last 5 months of the year.. that you are alive means you have something to be grateful for. So forget that you have not "achieved" anything and just give God praise for being alive. Here are my thoughts for the month of June..
1. Jesus did not have a "planner or shedule" . . He lived his life as led by God's words and in that anointing , He went about doing good and healing all those that were oppressed. .. How anointed are you for that future you desire? Men of old lived their lives in and through God's grace... find your relevance in God and go about doing good. Two days ago, a protégée of ours was sharing with my husband and I how God prospered him and his wife by simple obedience... He said when my husband told him some months ago to go do business, he was wondering what my husband was saying as all he knew was being a "pastor" (my words) Lol. But he obeyed by praying and making his research on what business to do. Today the business they ventured into is prospering beyond their imagination... He is doing the business with his wife and they now have a staff. What have you done with all you have heard from God's words and people anointed to help you make progress? Remember, you are not qualified for help when you keep disobeying instructions. .
3. Our faith and confession is key.. We must get to the point of living by faith and confessing what we want to see happen in our lives. What are you confessing over your spouse, children, business, country etc.. .. lets learn to align ourselves with God's words and confess those words over our lives plus situations and see God change things in our favour. 5. Collaborate with others.. many are looking but few see. When you see those that are making progress in the area you want to operate in, go and see how you can learn from them. Learn and start doing your thing. Don't forget to pay what you learnt forward. 6. Learn how to be a team player.. For some weeks now, I have been reading and meditating on Genesis 1:26.. here God said.. let us.. (Father, Son, and Holy Spirit ) make mankind in our image, after our likeness.. God, the father, son and Holy Spirit are team players. Together they achieved the creation of mankind. . How can you make your marriage work by being a team player? How can you do same in your work place, business, community , nation etc. The truth is whatever the team imagine is possible just as God acknowledged in Genesis 11:6a. God knows team works and the devil knows this too.. how can you ensure you are in a team that works? If we get this right.. We will have less stress in every area of our lives..
7. A dear friend reminded a group of us recently that we are all pilgrims on earth, so why all the fights, bitterness and rancour? Life is too short to spend it on things that will not help you or others.. so choose your battles.. live well and be joyful. Whatever you are going through will pass as you trust God. My dear friends, lets learn to live intentionally in all areas of our lives. Live life well with eternity in view. 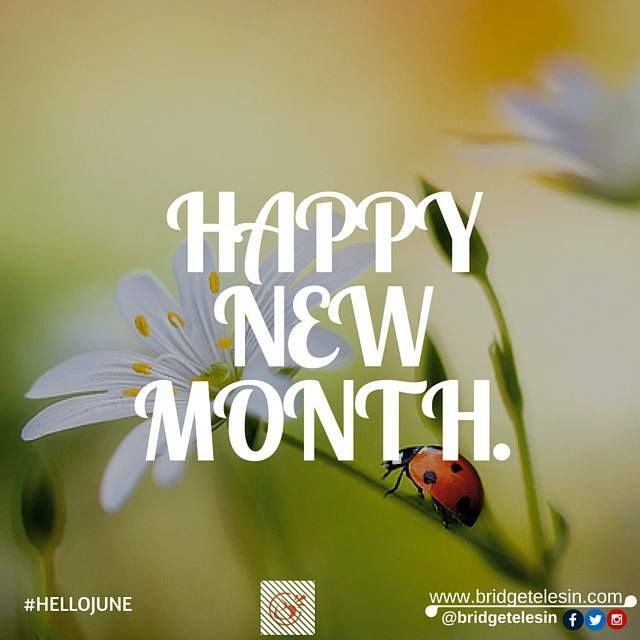 May God bless and keep us all this June. May we see progress on every side as we trust God and take faith steps to achieve our goals.